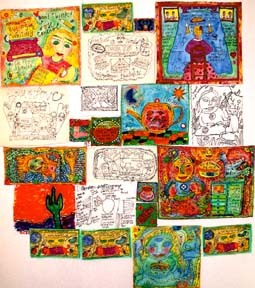 11-1-03 Turtle Trax Diary.Outsider Art quilts,paintings.Art Classes.Monthly Adult Art Class Workshops, airpen, fabric painting.Susan Shie.Turtle Moon Studios. 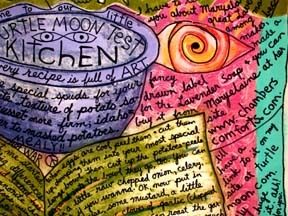 At left is a detail of the bottom panel of Cookbook Print Quilt #7: Potato Salad, only it's just in the stage where I have drawn and written on the printed and painted fabric panel, before Roxanne, Amanda, and Jessie quilt it, as part of our Island Press printing project at Washington University in St Louis. NOTE: This diary once again got a lot bigger than I'd planned. I always aim for 10 pix now....! 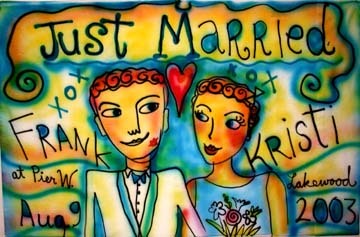 But Kristi got married to Frank, and I just got carried away! So enjoy it! Let me know the typos, please, coz I'm really tired right now! Whew! Topics in this diary: Camp from August, 03; "Dinah's Angel"; Kristi and Frank's wedding; Ohio Wesleyan trip; Jimmy's new leather work; Continuing work on the Island Press Cookbook Print Quilts (did #7 ); my birthday; Lavender soap label for Chambers' Comforts; "COW in Wooster"; "Eat in Wooster"; Doug's visit; "The Blossom Suite"; AQN meeting adventures; Halloween in Lakewood. Our Turtle Art Camp this August 6 - 12 included Deana Holmes of Mesa, AZ; Judy Olson of Seattle, WA; and Lisa Groshong of Columbia, MO. Here you can see the final results of our Lucky Samplers, which are the first real project in each class I teach, regardless of how long the class is. 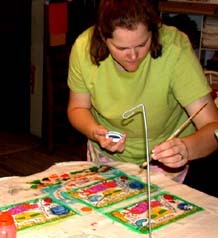 Everyone kept working on this piece after the basic sewing lessons were done, as we did painting, etc, so it gave us all something to do in between, or upstairs, when watching TV, or sitting at a restaurant. Left are my Yam Cream quilt above Deana's goddess piece, and right are Judy's foot sampler on left and Lisa's pincushion piece on the right. All the samplers are 5" square, give or take a little. Working that small, we actually get them done in camp and get other, larger stuff going, too. Everyone in this camp seemed to really enjoy learning about the airpen. Here Deana's giving it a go. You can see I've rigged up a thread thing (on left) now, to help suspend the air line, so you don't have to waste use of a hand, keeping that line out of the wet paint! Little by little, I'm getting this thing really figured out! Next I have to buy a couple more airpens... anybody got one they can't figure out and want to unload cheap? Then I have to work on how to work with them in places where we're down the hall from a sink, because at things like QSDS, where I'll be teaching next June, you certainly can't load up the paint cartridges in the classroom. Yes, folks, there's some mess with the airpen in putting in the paint, keeping it unclogged, and cleaning it up. But it makes such fine and rich lines, I'll figure out every last detail soon! For now it works great in my studio, close to the laundry room sink! Lisa, who REALLY loved the airpen, tore herself away from making lots of airpen beginnings of paintings, and worked here on our new group project. Since I decided the tee shirt project of old was too time consuming, we now do small paintings, in which everyone draws the same images on each piece, so they're multiples done free hand. Then, when there's no room to add more images or writing, we hand paint with brushes, each taking turns to do the same thing on each panel again, til they're all done. I think next time, this project will be an airpen thing, though up til now, we've used Rub-a-Dub markers for the lines. Using the airpen will get people loosened up, just like the tee shirt project made everyone get more used to the airbrush. Jimmy's still teaching airbrush at camp, don't worry! But to be really honest, I like airpen more. Maybe we can color some of our airpen works in with airbrush, instead of brushes though. Can't throw that baby out with the bath water! Judy knows a lot about flowers, and was giving me advice about how to keep my Shasta Daisies blooming longer (by deadheading, which is cutting off the dried up blooms.) She's one of those women who know tons of stuff about plants, and I could listen to her all day! I deadheaded the daisies, and I saved the dried blooms, hoping to get them to grow, by scattering their seeds around next Spring! Only I think my best bet is to separate the actual plants! It's just a LOT more work than throwing some seeds on the ground! Here's our fake quilt, made up of all the artwork worked on in this week's efforts, and tastefully arranged by the three students. I think there was even more black and white, airpen stuff that didn't get hung, because it created design problems. Things are just pinned to the Celutex workwall, and we usually do sample joining stitches, so that everyone gets the idea of how to join panels made separately. Of course then, everyone takes the work apart and takes their own work home, but they've all had a great time having to cooperate with other artists, in creating the masterpiece fondly known as the Fake Quilt! This is the start of a little commission I did, starting as an airpen demo in camp. I made sketches first, which is unusual for me, but the buyer had so many ideas she wanted to be included in a small space, that I needed to plan it out somewhat. My very last sketch was the one that made sense to me, but I still only used it as an idea for the layout. I can't stand tracing paper or other ways to copy verbatum. Must have lots of elbow room to move, when I draw! Here's the finished piece, 5.8"h x 8"w, which you can see in the 2003 New Works gallery, which I'm still going back and adding to, with works I made earlier this year. If you go look in the gallery, there's a link to the very large version of "Dinah's Angel." 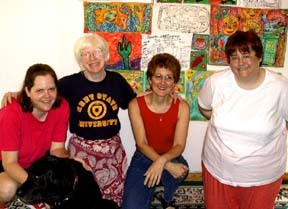 Lisa , me, Judy, and Deana all posed with our fake quilt at the end of Turtle Art Camp for August 6 - 12, 2003, but our dog Hattie wouldn't hold still. She and Lisa had a special friendship going all week! Sometimes the cats get all the attention, although Deana only had eyes for Evil Tulip! 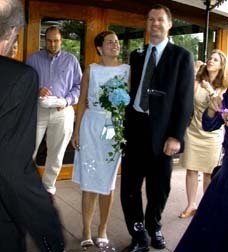 August 9, 2003: The wedding of Kristi Lambert and Frank Miller, Mike's oldest brother. Like Jimmy and me and Gretchen and Mike, Kristi and Frank took long time to get around to getting married, so this was very exciting! Pre-wedding excitement! Kristi gets a hug from Michael, and Gretchen gets her camera out! Everyone's ready to go! 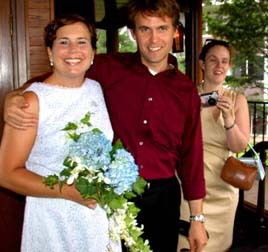 Check out Kristi's blue hydrangea bouquet, which she wanted and Eileen found for her! 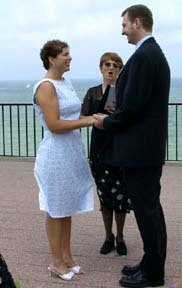 The actual ceremony, performed at Pier W in Lakewood, by Patty the Minister. I have to get her info from Kristi, but I know Patty will drive anywhere in Ohio to perform a wedding. The Lakewood Justice of the Peace wouldn't do it on a Saturday, so Kristi went on the internet! 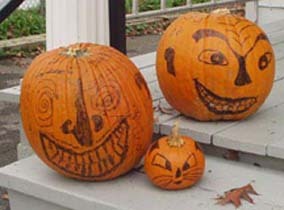 Happy Miller Family! 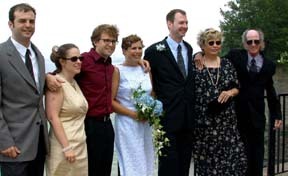 Brian, Gretchen, Michael, Kristi, Frank, Eileen, and Bud. 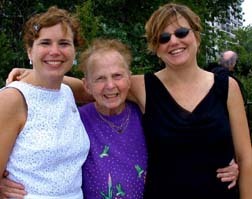 Kristi, her grandmother, Eddie, and Kristi's sister Amy are very happy to be together on this day. It's also Amy and her husband Tony's first wedding anniversary day! Bubbles for the bride and groom, courtesy of the purple rose and dove bubble blowers left from Gretchen and Mike's wedding, almost 3 years earlier... coz I save stuff! I made this airbrushed pillowcase Just Married sign for Kristi and Frank, and it didn't blow off the car on the way over to Michael and Gretchen's house, on the other side of Lakewood! It was hot off the presses, coz I made it as my airbrush demo in our August camp, which Jimmy and I had to play hookey from for that day, in order to be at the wedding! What good sports our students all were about it! Only I just know they were jumping on our beds and reading my diaries while we were gone! Oh well, we got to go to Frank and Kristi's wedding! Yea!!! 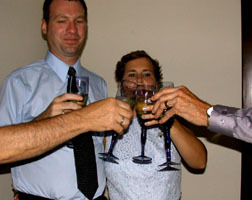 A toast to Mr. and Mrs. Francis E Miller! The cake! 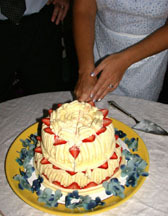 Some kind of Italian cream cake with strawberries, made at a special bakery in Rocky River. A Cassada Cake??? I think so. Look! Kristi had blue nailpolish! 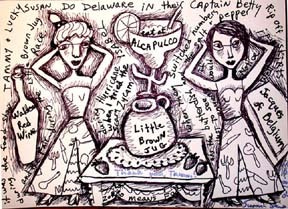 This is a small drawing I made of my adventure in Delaware, OH in mid Sept, teaching at Ohio Wesleyan University, in conjunction with an exhibition Jimmy and I had six quilts in, called "Consuming Passions: Edible by Design." 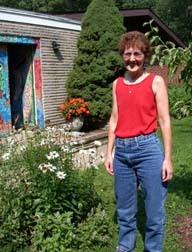 My new friend Tamm Wallace was in charge of the show at her John Ross Art Museum at Ohio Wesleyan, and I stayed with Tamm. The drawing is based on all the adventures we had together during my stay there. The show was all media, with quilts from several other quilt artists, besides us: Therese May, Laura Wasilowski, and Robbi Joy Eklow. Also painters, sculptors, metalsmiths, ceramists. 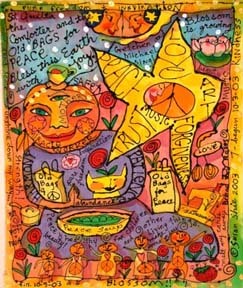 All the art related to food and cooking, so three of my Kitchen Tarot quilts were included.Four of us presented a panel discussion and slide talks, and I gave a workshop on my art quilt techniques. If you ever get asked to show at the Ross Art Museum, do it! What a lovely space, and what a very caring and professional staff and faculty they have at Ohio Wesleyan. Jimmy's been working very hard to keep up with his leather orders this year, since his article came out in the #4 issue of Art of Angling Journal. 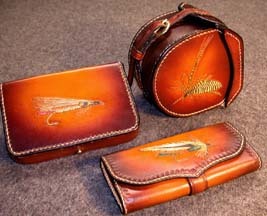 On the left are a fly case, a reel case, and a fly wallet(used to hold flies, not money). On the right is a very ornate fly case. Note: Jimmy also makes cases like this for sewing supplies! Even though he's now got a wait list up into April, 2004, for making his custom orders, please check out his site and place your order now, if you want anything made for next year. 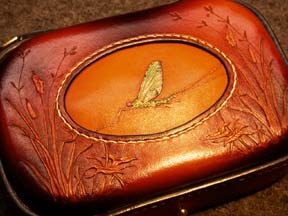 All his work is totally hand made, and all his artwork is done one little mark in the leather at a time, not with stamps. He designs the cases from scratch and would love to create something for you! 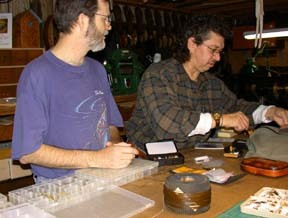 No one else in the whole world does leather work in the style Jimmy has created over his years of leather artmaking, since 1977. You can tell how proud I am of him! I love original styles so much in any art!!!!! This September I drew the outlines and did the writing on all 11 panels of the #7 Cookbook Print Quilt: Potato Salad, for my project with Island Press Print Workshop at Washington University, in St Louis. All the printed panels on fabric had been printed and painted by people at Island Press ahead of time, and for my part now, I select the appropriately numbered panels for the quilt that's next in line.This time I documented my writing and drawing on all the panels, before sending them off to Wash U for Amanda Verbeck, Roxanne Phillips, and Jessie van der Laan, my quilt collaborators, to turn into the seventh of 19 quilts in our project. I like to do the panels just before the girls are ready for them, since then I have all new diary stories for them to read while they're sewing. This is the only project I have where someone else is doing the quilting! They came to a camp here to learn my techniques, and they're staying true to my style of quilting. Just don't get some rumor going that now other people quilt my art quilts, OK??? This is a very special project with Print Quilts, a real anomaly. 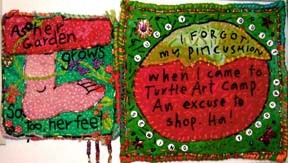 As far as I know, there is no other project like it in the art quilt world! Whooopeeee! The above photo is a detail from the currently unsewn middle of the huge central panel of the quilt, which will eventually measure around 75"h x 48"w. I will end up owning 8 quilts from this project. Isnt' that stunning????? 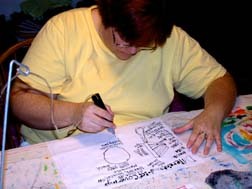 Well, plus the three quilt artists who're sewing and beading it are making the quilts very lush with texture, way more than you see here in my "before" stage, where you just see the print colors and my freehand black paint lines. They're doing all the sewing by hand, with lots of tiny stitches in my Lucky style. 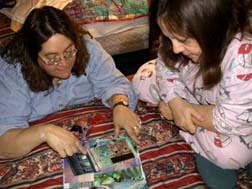 You can go back to my July 15, 2002 diary to read about the making of our first print quilt, and all the way back to my November 3, 1999 diary, to see when we first got together in St. Louis. This project has a long way to go, and I'm very happy to say I'll be taking off for St. Louis later this month, to rendezvous with my print quilters and also give a slide talk about my work at The City Museum, where Quilt National '03 is currently showing. My talk is on Sunday, Nov. 23, and one of my Blossom Suite pieces will be raffled off there, to help benefit the Women's Support project, which is what they bring QN to St. Louis for. Well, besides the sheer joy of seeing Quilt National anyhow! For my 53rd birthday celebration, Jimmy and I went up to Gretchen and Mike's house in Lakewood, where Gretchen made us a glorious supper, more like a banquet! Then we walked along the shore of Lake Erie and watched the sun go down. This is something Gretchen and Mike do a lot in their evenings, a true joy of living near such a huge inland sea. Looks just like the ocean to me! Jimmy took this picture just after supper, as Mike sat at his piano in the dining room, figuring out how a song goes, just like Dad used to do at home. Now that Michael has his piano at last, their home fills with his tunes, sometimes on piano, sometimes on guitar, but always reminding me of Dad's musical gifts to us, growing up. Also that day, we visited Jimmy's friend Ara, who owns The River Gallery in Rocky River, on Old Detroit Avenue, near Gretchen and Mike's house. If you get a chance to visit The River Gallery, you'll enjoy seeing some very wonderful fine art made in Cleveland. It's a large, sprawling gallery with lots of paintings, sculpture, ceramics, and glass art. Ara is also a well known fly tyer, and that's how he and Jimmy first became friends, through their mutual fish interests. 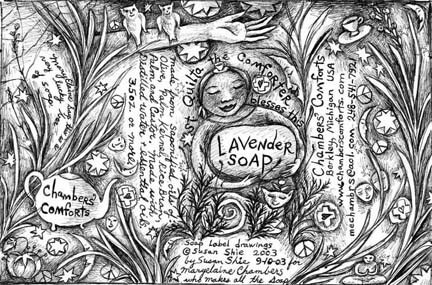 I'm proud to say you can now order very excellent and pure Lavender Soap with my drawn label, made by MaryElaine Chanbers, who makes all her own soaps by hand, under the name Chambers' Comforts. MaryElaine and I met on the Quilt Art email listserv, and have enjoyed becoming friends over the process of working out the design of this label. I think we'll do another label soon, too. Go to her site, check out the many different soaps she makes and sells, and tell me if you think one in particular would be the perfect choice for another drawn label. I'm leaning towards Patchouli, myself! Order your soaps now, before she gets swamped with orders for Christmas! This is "COW in Wooster," a whole cloth painted art quilt that's 8.5"h x 19"w.
I started this quilt as an Airpen demo, along with a brush on fabric paint demo in our August camp here, and then devoted much of my time to quilting it nonstop, right up til the entry deadline for a show at The College of Wooster's Art Museum, their first regional artist juried show, "Convergence." It got in, and it made me really happy, as this school is my undergrad college, and the piece is all about living in Wooster. You can see my favorite hometown hero, LeRoy, the guy on the courthouse, in the right side of the quilt. The piece is very textured with small quilting stitches of embroidery floss and perle cotton and perle rayon, along with beading. But the clear, rich black lines of the Airpen made it possible for me to not have to hand embroider over all my writing and lines, and this is why I truly love Airpen work!!! This piece, "Eat in Wooster," and a third 2003 piece, "Flight of the Art Angels," were also juried by Dennis Harrington of Cincinnati, into "Convergence" at The College of Wooster Art Museum. "Eat in Wooster" is 44"h x 6"w, and is made up of nine of my Lucky Samplers, one of which I make in each class I teach. This year I had decided to work with places to eat in Wooster for my Samplers' themes, so that I could have the little quilts as kind of flash cards for our Turtle Art Camp students, to help them decide where we'd go to have supper each night, after working hard in the studios all day! Then I saw them hanging on my wall, one above the other, and I KNEW I'd love to see them become this long, skinny quilt column of restaurants! The Barn, where you can feed the ducks at the lake, and maybe have Jackie, the most fun waitress in the area. The Parlor, where we go for breakfast on our downtown excursion trip. Sausage Babies! Gloria rode the bull at Gilly's once! The Food Co-op, now called Wooster Natural Foods, where we buy good foods! King Garden Chinese Buffet, with the best Wonton Soup on the planet. The Hero House, with the best mushrooms in town! Been there over 30 years, I bet! The Green Leaf, which my parents loved! El Canelo, very cool Mexican place. Get a gigantic fijita that steams and sizzles! Coccia House, family owned since 1958. Best pizza ever! Matsos' Family Greek Restaurant, starring Spiro Matsos, who'll entertain you and stuff you full of garlic bread before your meal comes! There are new restaurants opening and old ones closing or changing around. I'll do some more restaurant samplers, but for now am working on stores in Wooster, starting with Early's store, the antique emporium called Uptown Downtown. While you're at it, if you have time, go see our Gallery One (the larger quilts), which I'm now adding more things to finally. Some of the photos are larger there now, too. Doug Hall, Jimmy's best friend, aka The Emir of Atlanta, came to visit last month, and he and Jimmy got to talk fly fishing for long periods of gleeful man gossip! Here I think they were plotting which fake bugs to take with them on the day they got to fish down at Mohican State Park. Jimmy's so overjoyed, you can almost see a little smile on hsi happy face! That's my Jimmy! I made a series of paintings in October called "The Blossom Suite" - 18 paintings in all, roughly 12" x 14", but varied sizes. Five went to benefit art auctions, and I'm selling the others for people to frame, hang as is, unstretched, or quilt. The sub theme of this suite is "The Old Bags for Peace," because the New England Quilt Museum's auction theme was BAGS! Well, it's a long story, but check it out! You can see them in the New Paintings Gallery. Three of the ones for sale are up in larger form, and the sold ones are shrunken down to smaller size, but shown still, along with the auction pieces. I'll put more of the large images of paintings for sale up, when the ones there now are sold. Right now four have sold, and I'm kinda hanging on to #1 and #12, so there are still seven to sell. Half the money from these sales goes into a Maternity Leave fund for my daughter, who's planning to get pregnant soon. 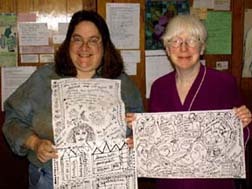 AQN - Art Quilt Network - had its Fall, 2003 retreat in Columbus October 22 - 26. 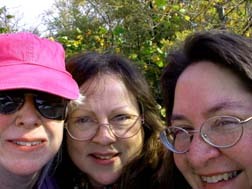 My two best AQN friends are Michele Merges Martens and Linda Scholten, and we roomed together (only Linda left us for Carol Vasenko after one night of too much laughter...!) Linda is our group's Secretary AND Treasurer, and you won't find anyone who works harder for the group! Plus she's the world's foremost sewing machine expert, in my book! Michele gave an in-depth presentation of her work at this meeting, including slides and a lecture about her whole art career. She's also an extremely good poet! Above from left are: Michele and Linda checking out Michele's new mixed media art book; me, Linda, and Michele being sneaky out by the Olentangy River; and Michele and I showing off our airpen drawings on fabric at my house, after we got back here from AQN. It was a lovely time, and I really got a lot of seewing done during those great meeting days! Yea! So nice to see all our friends in that group, some of whom I've known since I joined in 1988. Here's my sweet Gretchen now! 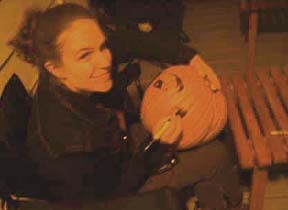 As I was finishing up this diary, she sent me these shots Michael and she took yesterday, while getting ready to have Trick or Treat! They really enjoyed their first chance to give out candy to the kids from their very first ever front porch! Adios! See you again with the next diary installment around February 15. 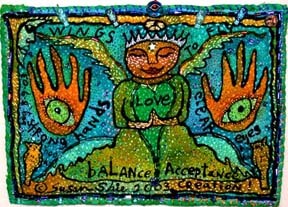 Web site origianlly created by Susan Shie and Jan Cabral ©1997. Subsequent web site work © Susan Shie 1997 - 2005. 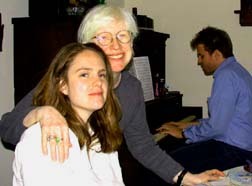 This page updated by Susan Shie, February 5, 2005. Web site hosting by Key to the Web, Ltd. ©2005.